Welcome to the world of Animal Country. In this world, there exists thousands of animals except for 1; man. That is, until a strange baby was found by the young raccoon Monoko. Now, she has made it her duty to be the child's mother in this world where the strong eat and the weak are eaten! 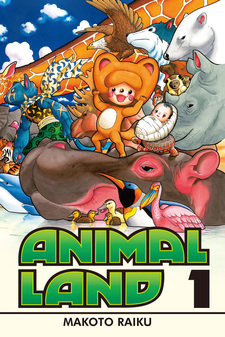 Doubutsu no Kuni has been published in English as Animal Land by Kodansha Comics USA since August 16, 2011. Welcome to Animal Country, a world filled with millions of different kinds of animals. Some eat plants, some eat meat, some eat both. Each animal has their own unique voice they use to communicate, but they are unable to understand the voices of animals that don’t use their cry. In this world there exists no universal language. Thus, it is a savage place where the strong prey upon the weak and one must fight to survive. It is a planet much like the one called earth, the only difference being that on this planet the animal known as “man” does not exist. At least until now. 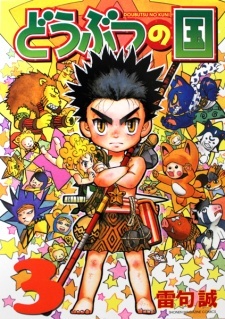 Animal Country is the ninth work of manga author Makoto Raiku. Many of you may know him as the mangaka of the weird but incredibly heartfelt "Konjiki no Gash!!" (or “Zatch Bell” in the dub). Those who are familiar with it may have some idea of what to expect from Doubutsu no Kuni. But whether you’ve read Gash or not, Doubutsu no Kuni is similar in some ways but VERY different in others. Instead of being published in the more “conservative” and “kid-friendly” ‘Shounen Sunday’ Raiku has switched magazines to ‘Bessatsu Shounen Magazine’ which is the same magazine that publishes Attack on Titan. Yes, Makoto Raiku is not holding anything back in this series and he’s firing on all cylinders. This is like Gash if it wasn’t made for a childhood audience. Whether you’re familiar with the author or not, be prepared. Our story begins with the recently orphaned tanuki Monoko whose parents were killed by a Lynx not long ago. One day, when fishing, she stumbles not upon food, but a mysterious bundle of cloth floating down the stream. Inside of that bundle is a human child. Not knowing what animal the baby is, Monoko instantly falls in love with its smile, brings it home and vows to become its mother. The baby who, in another time and place, was abandoned by his real mother, is named Tarouza. There is something special about Tarouza however, which Monoko’s tanuki clan discovers very quickly. Tarouza possesses a cry which any animal can understand, a cry known as "words". After spending much time with the Tanuki, and viewing firsthand the cruel "be or be eaten" law of the world, Tarouza soon resolves to create a world where animals do not have to devour one another to survive. Is it possible for Tarouza to succeed? How will meat-eating animals survive in this world if they cannot eat meat? Is Tarouza the only human left in Animal Country, and is he the only one who can utilize the cry of "words"? As far as art goes, Raiku's clunky, slightly off model and blocky art style from Gash is still present here, if not a bit improved because of practice. The art is definitely viewable and legible but depending on who looks at it, it might be a bit hard on the eyes (I personally don’t like how he draws teeth in wide smiles. He really likes drawing the gums too and it just looks weird). In other ways, however, Raiku's artstyle certainly works to great effect. This is especially true for the designs of the many animals and monsters in the story, which Raiku draws with his own flare and unique charm. What is most commendable is his use of shadow or “lighting” and attention to detail. To create something "imposing" and "menacing" Raiku adopts very dark and sketchy style which adds a lot of ‘weight’ to the image, and at times makes it feel as if the reader is in the place of the prey staring straight into the eyes of the hunter. The designs of many animals in this story are also one of a kind. Deviating from 'natural' design, Makoto Raiku will often put human articles of clothing such as pants, skirts, armor, helmets, and jewelry on the animal characters. This gives them a modern yet still "wild" looking appearance and gives each one their own distinct vibe and personality, even the one-note characters. The humans are a bit more conventional looking, but since there are a small number of them, Raiku introduces each one in their own way and makes sure they leave an impression before moving onward. The humans are more personality over design. All in all, the art does work very well for this series. One detriment I found was the overuse of double page spreads. In a manga of this scale and telling a story of this level, with massive monsters and animals around every corner, double page spreads are a bit of a give-in to illustrate grand scale, or an epic ‘turn against the tide’ moment. However, near the final arc, I found they started to become a bit overused. Nothing felt small anymore because everything was too big. Could have been toned down a bit. The story, while definitely unexpected and unpredictable, is not without its flaws. The pacing of this story is undeniably fast. After volume three, expect this story to sky rocket forward at a break neck pace, hardly stopping for breath. This could be seen as a good thing or a very bad thing depending on who you ask. Good because it takes a break from standard shounen cliché which can be full of padding and filler (often linger and drags out moments which don't need to be lingered on). Bad because there may not be enough time to get used to the many new characters introduced, and the two time skips almost make it disorienting. But, to his credit, in the fights that really matter, Raiku MAKES you care about the Tiger we've only seen in two panels, or the hippo who has only said three lines of dialogue. He does this through heart breaking flashbacks in the heat of battle and by clearly illustrating the bonds that all these animals have, and he does it with gusto. There is a problem to this however, and it is pacing. Because many things were rushed through, or skipped over and not "shown", we lack connection to many of the animals introduced into Tarouza's army. We don't know them like he does and when we see them fighting we're not given as much reason to care as we should, and repeated flashbacks through battle only works so many times before it becomes overused. This isn’t the first time Raiku has used flashbacks in battle as a form of storytelling and exposition. He did it a lot in Konjiki no Gash as well. However, it worked a lot better in Gash Bell because we spent more time with the characters. The fights in the final arc of Doubutsu no Kuni are very close together, stack upon one another without pause, and follow the same kind of formula. Since we haven’t spent as much time with the characters, Raiku’s formula gets repetitive much too quickly. What makes it even worse is that there are entire armies on the screen and we just don’t have time for this many different characters all at once, and many once important characters are left standing idle. Raiku's characterization is still wonderful and he knows when and how to stick in the knife and twist it to great effect, though these methods were not applied very well in Doubutsu no Kuni. Some of the battles in the final arc can feel very tedious when they stack upon each other and follow the same general formula. There was a bit too much happening all at once. There is a strong heart at its core but it overshot the mark just a bit. There are also a lot of plot elements that kind of show up without foreshadowing or buildup, and then aren’t expounded upon. They feel very sudden, surprising, and at worst ‘cheap’ because there was no proper foreshadowing which leaves us disoriented. Another thing that suffers because of the pacing are the characters. Animals inside and out of Tarouza’s village never have the role or the impact that you think they would. This is a very “plot and themes” over “characters” manga. Some characters stand out, some have their one note in the sun before burning out, while many others are just kind of there (Like Moko, or even Kurokagi, who you think would be a big deal, but for most of the manga he’s just Tarouza’s mount). Instead of timeskipping all over the place, I think the manga would have worked better if we’d spent more time with Tarouza as he recruited his army: meeting the animals when he met them, and getting to know them when he got to know them. We only really needed a single volume of this between the “childhood” and “adult” arc of this manga. That isn’t to say that all of the characters are bad. As if making up for the few he left idle, there are many compelling and well rounded stars in this series. Reimu ties in heavily with the plot and world building; Capri is a perfect representative for the side of carnivores. Jyu, despite his lack of screen time, is just too much wild fun not to enjoy. Even our main villain Giller, who seems mad and incomprehensible at first glance, actually has a very strong and understandable purpose to his madness which was all quite pitiable when laid out on the table. Thankfully Giller is not a mustache twirling jerk for the sake of being a jerk, or an all-powerful demigod monster like Clear Note, from Gash, was. Giller is a villain you’ll love to hate, but he’s also human. That leaves us with Tarouza. Is he a good protagonist? I think he fits the role. He’s slightly mary sure, but considering the scale of this manga, it wouldn’t work if he wasn’t. Tarouza’s worst offense is having a special power that he just ‘got’ and no one else has it, and it’s not his ability to talk to every animal. Unlike a mary sue, he goes through his fair share of hardship and suffering and you really understand and really buy why he wants to accomplish what he does. And even if there is no hope left, you root for him because just like the animals, you have faith in what he will decide. He earns every victory he works for because he tries as hard as he possibly can. Luckily Makoto Raiku realizes that this is not simply a black and white conflict. No one side is right here. Tarouza’s idealistic world view is constantly challenged and questioned around every single turn he takes. Countless reasons are given on why all animals can’t live in peace. It is a natural law of the world, meat eaters will die if they can’t hunt, if all animals get along the world could fall apart. And Tarouza doesn’t simply reject these concepts, because Tarouza can hear the voices of all animals. He doesn’t reject any of the ideas or challenges thrown to him, which is a wonderful quality for a protagonist, Tarouza instead tries with all his power to compromise. He falls, he stumbles, he sees hopelessness, he suffers unbearably, but he knows the happiness he wishes for is something that can be obtained, and he wants to gain it no matter the cost. Despite the moral ambiguity and gray areas that this series is full of, Makoto Raiku does like lean slightly more to the side of plant eaters and herbivores with Tarouza. This isn’t to say he shuns the meat eaters or paints them all as evil, because there are many carnivores in Tarouza’s army as well and they each get a vivid perspective and voice in this story. Some of these meat eaters start out with the mindset that a “world where all animals can live in peace” can never exist, but their world view is challenged and changes in time, and that isn’t always the cause of Tarouza—which is nice. The only problem is that there are a few irredeemable one-note assholes in this series and they’re always on the meat eater side (if we’re not counting Giller’s madhouse of monsters, and even if we are, they’re against Tarouza’s ideal world anyway) and the worst the plant eaters get is having idiots. Some are idiots (cough cough, Paiman, cough) but they’re not jerks or inherently evil. What’s even more commendable is that Raiku gives some of the monsters, which are neither plant eater or meat eater, a perspective and voice in this tale. Many of Giller’s monsters are one-note jerks like the meat eaters, just on a way grander scale, but Raiku doesn’t make them or even our main villain, Giller, any less human. Characters like Luke, Salad Udon, and eventually Robin, have their own thoughts, voices, perspectives, and own hurdles that they must overcome as a character. Luke is an interesting example of this, for his character arc has little to do with Tarouza’s ideal world, and more to do with finding his own sense of self. And instead of coming off as pretentious or annoyingly existentialist, it fits with the tone of the series and adds more colors to the already colorful pallet that is Doubutsu no Kuni. Doubutsu no Kuni starts out as a very small and simple tale about a human boy being adopted by a lonely tanuki. It quickly explodes and skyrockets upward into a story with many unpredictable twists and turns. However, the story may have overestimated itself and became a bit too big to handle. It has its fair share of flaws, and depending on who you ask, may work or hurt the series. But all in all, it is undoubtedly something special. If you’re looking for a story that’s never been quite told before, and epic battle which questions the laws that make this world, give this one a try. It definitely won’t be a waste of time. I decided that my first review would be of my number one manga series of all time. I was shocked to see how few people have actually read this series when it's just so great and easily surpasses the more popular long running manga series out there, in just 14 volumes. The story for Animal Land is like a Roller coaster ride, in the best possible way. Things keep escalating and the story really evolves (heh) throughout the manga. It doesn't waste anytime doing what it wants to do and had me hooked the whole way through. The creator has done an amazing job at showing the audience just how brutal and difficult it is to survive in this world, as well as how changing it, isn't going to be easy. I'll just give my thoughts on the two main characters to avoid spoilers, but just know that the rest of the cast is great as well! Then we have Monoko, the Tanuki who adopts Tarouza and raises him as his her own. She's more than just a comic relief character, as she definitely has the most mental growth out of everyone in my opinion. She really does her best to be a the mother Tarouza needs and helps him to survive in this world. Very impressive! Considering the amount of different animal species he had to draw he did an amazing job. The artworks really expressive too and you can really see what a character is feeling. The fight scenes get very intense and bloody, and i was blown away by them! I love this manga. I've read it three times now and enjoyed it every time. Yes, it's very quirky and weird at times but it's also thrilling and epic. It's the only manga that has made me cry so much i had to stop reading it! Please give this manga a chance. Go into it with an open mind and you won't be disappointed. The story started at animal land, place where was never seen a single human. Lonely tanuki named Monoko find a human baby Tarouza, and become his mother. Later Tarouza realize that he can understand other animals cry, so he decided to make world there plant-eating and meat-eating animals can live together. We can split whole manga in two parts, first then Tarouza is growing and acknowledge all sides of wild world of animal land. And the first problem i have is in how Doubutsu no Kuni looks. Its has it "cute and funny" style to it, and even trying to throw couple of jokes here and there. But on the over hand it always shows the brutal reality of animal world, and Tarouza which is struggling to create its own world where everyone can live together. I don't think that the art style is really fit that story. The design is very good and detailed, also its very unique in its own way, but i might say that it should have more realistic looks to it. So the second part of manga is then Tarouza already grown up. And this part is just battles, battles, battles, battles and to the end its BATTLES. Good guy beating bad guy over and over.... And it was kinda disappointing to me. The battles is really good, but it's all whats happens in second part. There is a lot back story in second part, but problem is, that it is so generic and just boring. Overall I think it is a good manga. Personally i want it to be more then just battle manga later on, but thats just my personal preference. I highly recommend this one to read, because its not trying to be genius but still it has its moments. I was indecisive between scoring this a 7 or an 8. But I have decided it must land itself an 8. The art style is definitely not for everyone. This isn't a story about some cute and fuzzy animals. There's sweetness to be sure, and tears, but it is the struggle of life with some really strange looking critters. Many of whom have oddly human faces, I suppose to more easily put across their expressions. But despite that oddness there's still something engaging about reading this. All centered upon a baby who brings something unexpected to the world, more than just being a bundle to be taken care of. One of the parts which grabbed me is how it centers around a bunch of weak little things banding together and doing great things despite their fear.